Pi2Go Basic Kit is a Raspberry Pi programmable floor robot designed for middle-school children ages 8 to 16 years old. 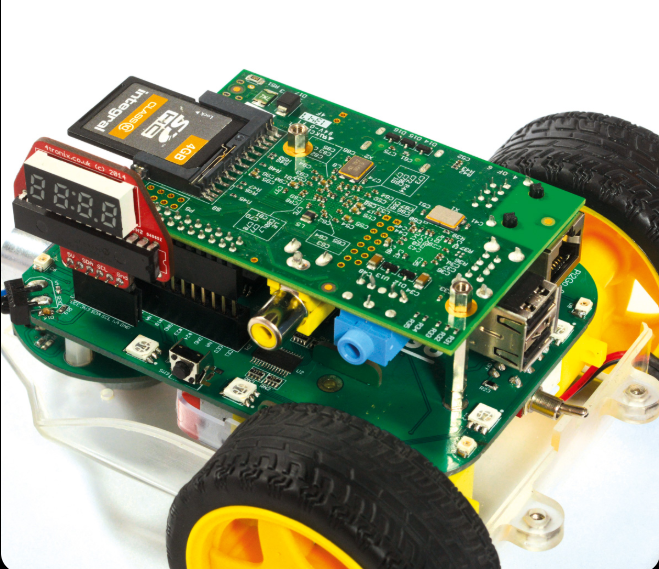 For absolute beginners, it’s important to know about Raspberry Pi before we explore the robot. Raspberry Pi is a compact, small-sized and low-cost computer that plugs into a monitor or TV, and uses a standard keyboard and mouse. It enables people to explore computing and learn to program in languages like Scratch and Python. The transparent robot case serves two purpose; it is specially designed to keep Pi2Go safe from every kind of external hazards. Also, to help you look through the case for understanding how technically everything works for better learning experience. Pi2Go has an extensive range of inputs/outputs to program, helping you to gain maximum knowledge from your projects while enjoying your classroom time as well. Learning to control the inputs and outputs of modules is fun. All the different modules such as line following, ultra-sonic sensors, motors, RGB LEDs etc. can be controlled. The robot can be controlled via Wi-Fi or the commands can be directly programmed into Pi2Go using the pen drive. Knowing that students will only learn for good in a safe and protective learning environment gives confidence to teacher and parents to use this robot. At the same time, kids learn to plan, wireframe, design and program in minimal time. These practical project benefit kids in two primary ways. First, it creates interest and help kids to focus, build mental stamina, power to think and implement solutions. Second, it teaches them to be patient, learn to understand the process, pay attention to details and they get more attached to learning in whole.